While the plot of Jason Bourne was not as cohesive as the first three films, it still is a vast improvement over The Bourne Legacy. Jason Bourne marks the return of Matt Damon to the Bourne franchise, from which he was absent from for 9 years. Fans clamored to see Damon reprise the role that he made famous and this return was just what the franchise needed - some "new" life breathed into it. When we meet up with him again we see Jason Bourne living off the grid but not living completely in peace. His past haunts him. At the same time new ghosts appear and after finding out that his father was killed not by terrorists like he was led to believe, but by his own government, he goes out in search of answers. Damon stars alongside the talented Alicia Vikander (The Danish Girl), who plays CIA Agent Heather Lee, Riz Ahmed (Nightcrawler) as electronics mogul Aaron Kallor, Julia Stiles (Silver Linings Playbook), who returns as Nicky Parsons and last, but not least, Tommy Lee Jones (Men in Black), who plays the head of the CIA, Robert Dewey. Not only did Damon make his way back to the franchise, but director Paul Greengrass (Captain Phillips) did, as well; and the combination of these two factors brought back a whole new excitement. The rest of the cast also helped to create a great film experience that reminds audiences why they loved the franchise to begin with. Stiles is still a favorite in her role as Parsons, and Alicia Vikander is a serious talent and delight to watch. It goes without saying that Tommy Lee Jones always adds a little something extra to any film he joins, and this one is no exception. Encoded in 2160p the Bourne series has never looked better. Blacks are spot on, colors pop off the screen, and highlights and natural light are elevated compared to the Blu-ray 1080p version. Accompanying this over-the-top video is a DTS:X 7.1 audio mix which uses all the channels quiet smartly to create a full 360 experience for the user. Bringing Back Bourne (8:15): A look at bringing back Damon and Greengrass to the franchise, including technical aspects of the film and Damon's preparation for the role. • Bare-Knuckle Boxing (7:55): A look into Damon's physical training for the role. • Underground Rumble (5:59): A look at the pivotal fight sequence in the film. The Athens Escape (5:37): A look at one of the film's car chase sequences. • Convention Chaos (6:36): Shows the ins and outs of filming some key scenes in Vegas. • Shutting Down the Strip (8:24): A look at scenes filmed on the famous strip in Vegas. While the plot of Jason Bourne was not as cohesive as the first three films, it still is a vast improvement over The Bourne Legacy. It was a pleasure seeing Matt Damon return to the role that helped redefine action movies in this century. If you are a fan of the first three film and lost interest after the fourth then this film is the perfect reason for you to return to that world. 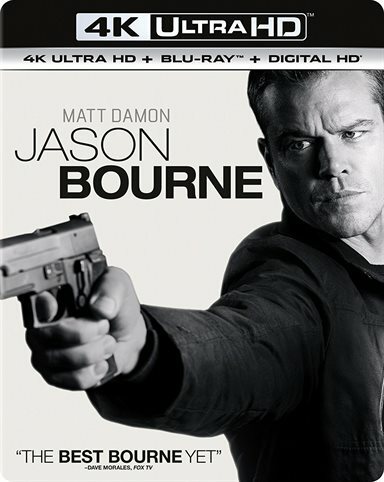 Download Jason Bourne from the iTunes Store in Digial HD. For more information about Jason Bourne visit the FlickDirect Movie Database.